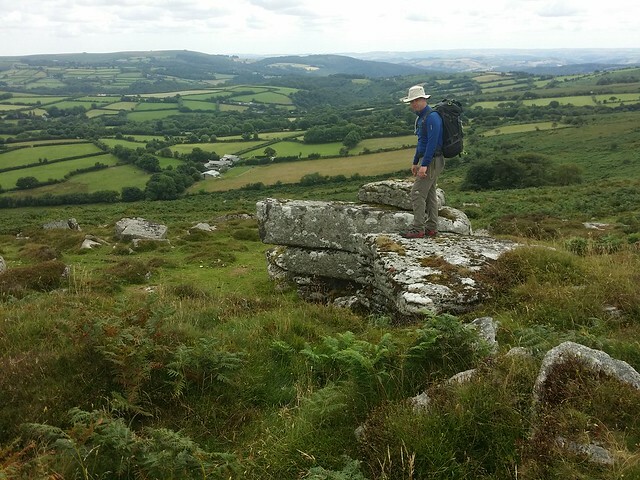 Late July weekend, five of us converged on Dartmoor with the intention of climbing the Social Hiking Tor Bagging Ladder and a wild camp into the bargain. 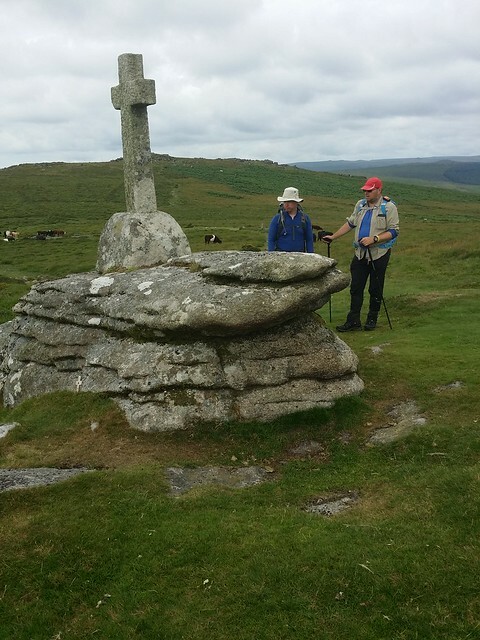 With Colin and his brother Neil heading for the Hound Tor area, whilst Jim, Matthew and I were bound for Dartmeet. Both our parties went separate ways after a breakfast at the Fox Tor Cafe, agreeing to meet up at the Old Inn, in Widecombe, that evening. Let the day begin! Beginning at Dartmeet on this circular would save us a sting in the tail, yet arguably, starting with a hill is just as difficult. 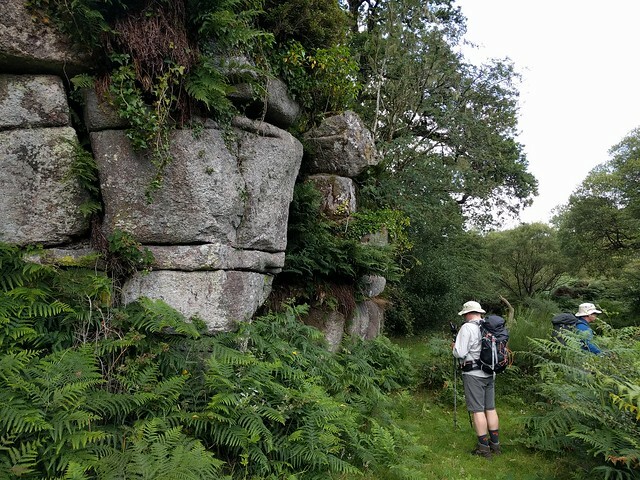 We trudged up the road for the majority of the ascent on to Yartor Down, then cut inland to introduce Matthew to The Coffin Stone; a split rock where bearers, enroute to Widecombe-on-the-Moor, would take a breather, resting the coffin across the granite. 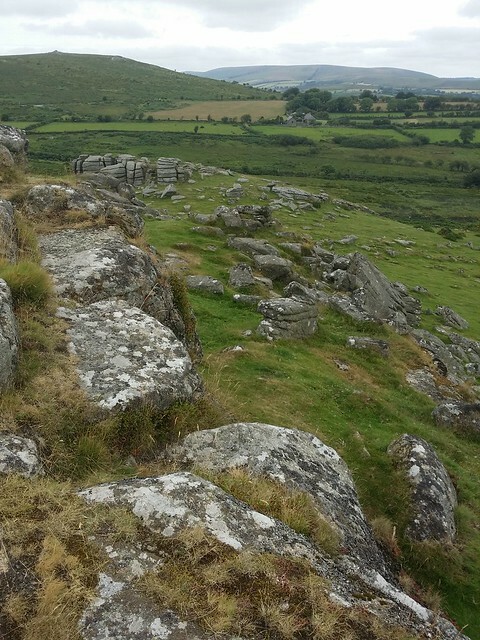 From the stone, Sharp Tor is not in view. I underestimated (or should I say, "didn't really look at") the distance and direction, unnecessarily leading us up over the down instead of around. Matthew remarked there is nothing like going up a hill you didn't need to, or something to that effect. It meant we had to drop down into the re-entrant where Rowbrook begins, just above the farm with the same name. Sharp Tor (Yartor Down) now stood above us. For a tor so close to a car park, I loved this imposing ridge of granite. It was my first visit, yet I have passed it countless times in the car and never stopped; I certainly won't neglect it again! It has a commanding view south to the Dart Valley Nature Reserve and the dam at Venford Reservoir beyond. 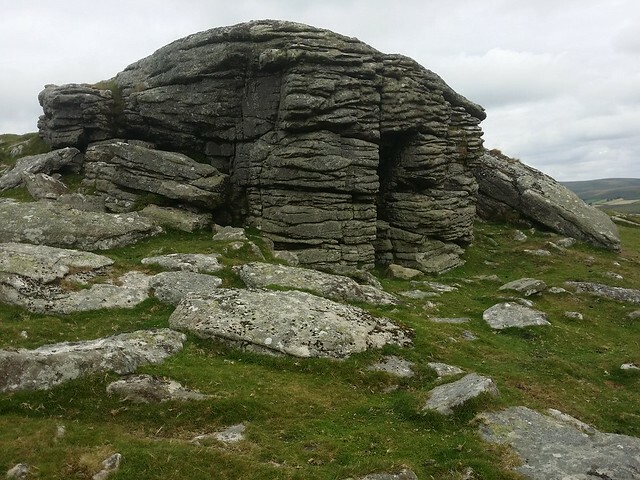 As an aside, if you've seen the little known thriller "Dartmoor Killing", then the tor and the nearby area of Poundsgate will be familiar, as it was the location for the film. 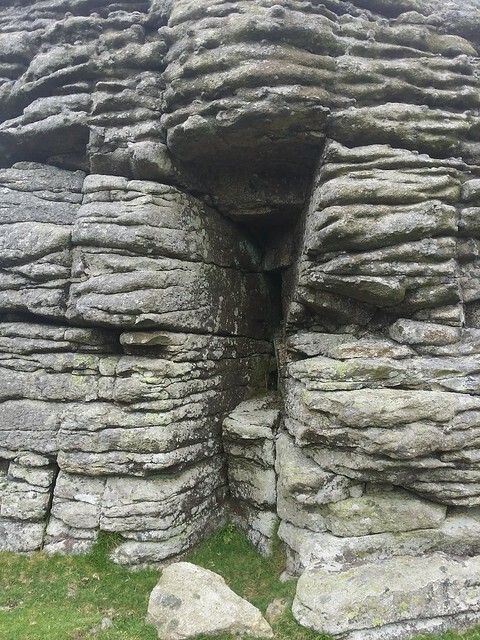 We moved on to visit the lesser known neighbour, Little Sharp Tor. A small outcrop, but a fine one with good views of Rowbrook and further to the Dart valley. This approach was a much more sedate affair and just as well with plenty of the route still to be done. With a nearby car park, this tor is perfect for a stroll, maybe a picnic, but, unfortunately, wild camping is not permitted on any of Yartor or Corndon Downs. We went eastwards, visiting Cave-Penney Cross enroute to Corndon Down. 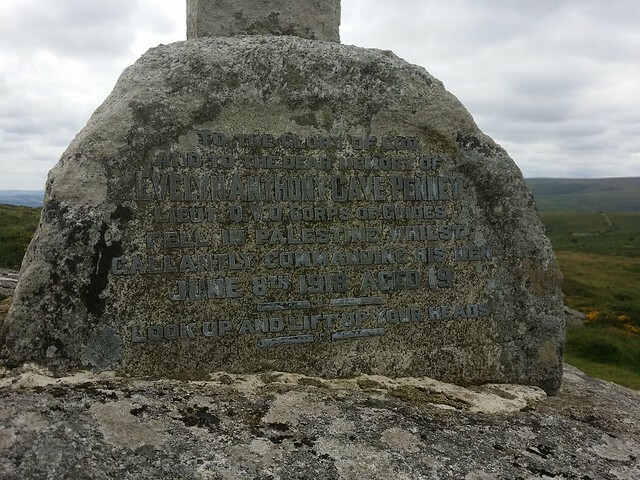 This memorial was erected in memory of Lieutenant Evelyn Cave-Penney, a nineteen year old local who was killed by a sniper in Palestine in the First World War. 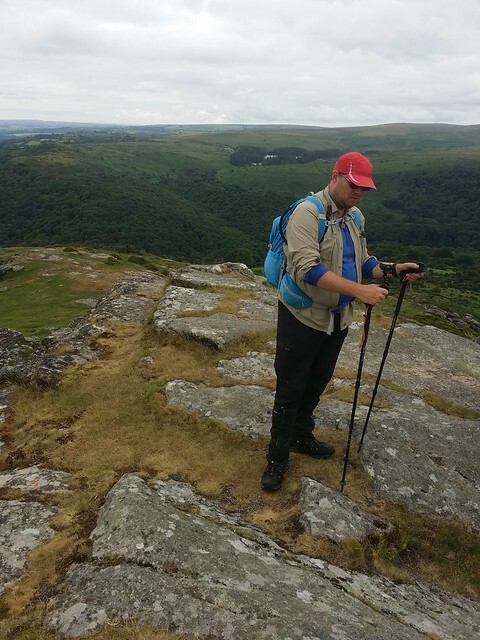 We took the well trodden route up to Corndon Tor (Corndon Down). The highest outcrop is less interesting than the lower collection further east, and I bypassed it to get a good look at the more substantial ones. Corndon Tor (Corndon Down) upper outcrop. Matthew and Jim remained at the top. I'm used to others not having the inclination to explore all of a tor, the bag being good enough, and I appreciate their patience. 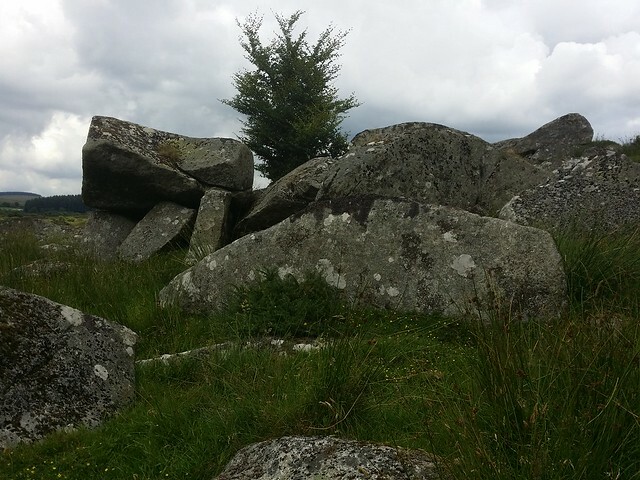 After inspecting the lower crop I rejoined them and we passed over a huge cairn on our way to Corndon North Tor, spotting another couple of the Bronze Age burial mounds further on. It is a prominent location to be interred. Corndon North Tor is just off the top of the hill, east of where two of the cairns sit. Its vista is of the West Webburn valley below, with Rowden Tor, Wind Tor beyond. 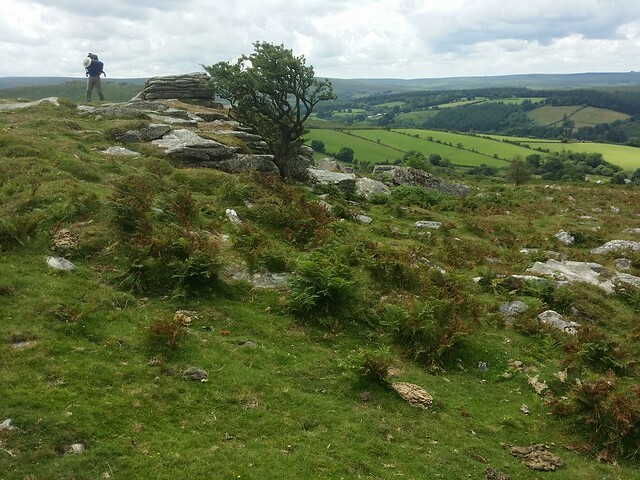 Dominating the scene is the Hameldown ridge but some of the prominent tors of the Haytor Down area can be spotted on the horizon. We returned to the top of the hill, moving north. There was a side visit to Cathanger Rock which turned out to be our lunch stop. As I write this up, checking the times against both map and photographs to jog my memory, I was surprised to see we lingered here for a good half hour! It was a warm day, the view was a good one, why rush? It seems Jim, Matthew and I have perfected the art of tor sitting. The name "Cathanger Rock" conjures up all sorts of macabre images. 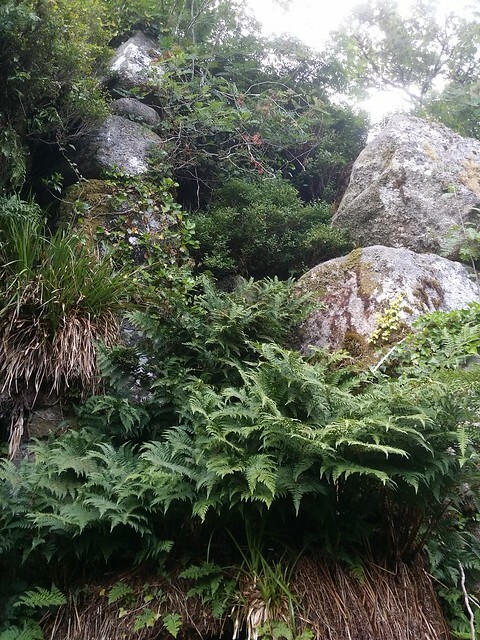 One interpretation is that a wild cat made its sett underneath the overhang of the outcrop. This is a small, but pleasing outcrop with a rugged hawthorn adding to its character. 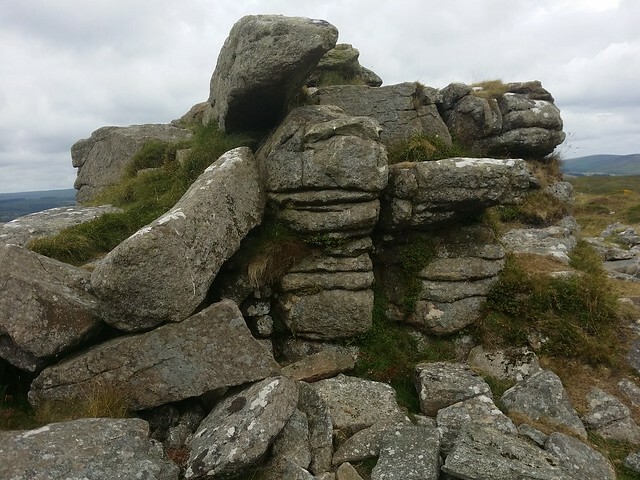 It is certainly worthy of being named "Cathanger Tor" and not the lesser title of "Rock". We had a few kilometres to walk to our next bag, mindful there was a chance we may not be able to gain entry. Stepping off Corndon Down, we were on metalled road moving north to Cator Common. About a kilometre of the road is part of the Forest Perambulation, or its modern version thanks to private land preventing the 1240 route being followed. The road turned north-west, and dropped down to the bridge across the Wallabrook, near a small farm called Riddon Brake. The stream was being enjoyed by plenty of families, picnicking on its bank, making the most of the good weather. Before reaching the bridge, we took a right through an unlocked gate, into a field alongside the brook. We were fortunate that the ground wasn't sodden, the water levels low. It took hardly any time to reach the edge of the disappointing outcrop named Cator, but a ring of barbed wire stopped us reaching it properly. We made do with touching its outermost edge with our walking poles. I can only speculate why this section of land was fenced off, appearing, to us anyway, to be a patch of unremarkable flood plain. It could be to deter livestock but it doesn't look particularly hazardous. 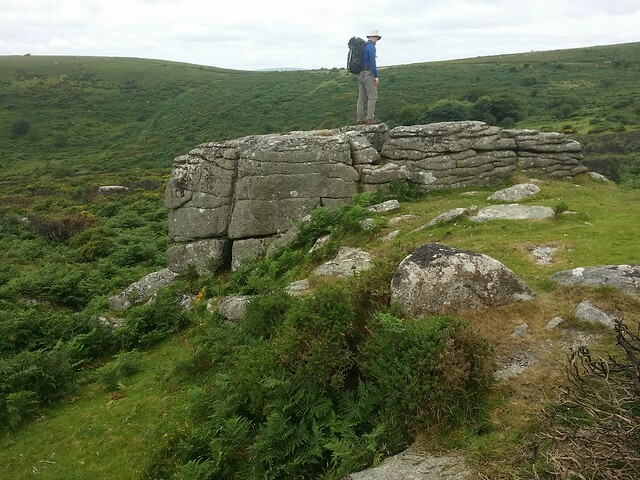 I know of the scheduled monument 400m east of the tor, so was there something else here? If anyone knows, please enlighten me! One day, I might return and view it from the Open Access land in the north, to see if I can figure it out. Crossing the Wallabrook, we had a long climb up over Riddon Ridge. The day was warmer and when we reached the top of the hill, I removed the lower half of my convertible trousers to get some air. In hindsight this was probably not very wise, as the descent down to the East Dart was through a lot of sharp gorse and overgrown bracken with potential for ticks. As we descended, I got a message from Colin; they had finished and were wondering when we would be at the pub. They must have raced around their route because we still had a couple of hours to go. Obviously, no serious tor sitting being done by the Astbury brothers! Down beside the river, the going along its flood plain was so much easier than my last visit back in January (post here). We still managed to find some soggy sections but footfall was a lot firmer. We neared our next bag, still hidden by the foliage along the river, but now we needed to get to the other bank. I found a likely looking spot and we congregated at the edge contemplating the difficulty and the temperature. Off with the boots, I was first to cross. Matthew watched on expectantly with his camera, hopeful of a £250 prize on "You've Been Framed". To my delight, it was relatively simple and the temperature was such that I would have welcomed a wild swim had I brought a towel! Clambering out the other side, the others realised they'd have to join me. 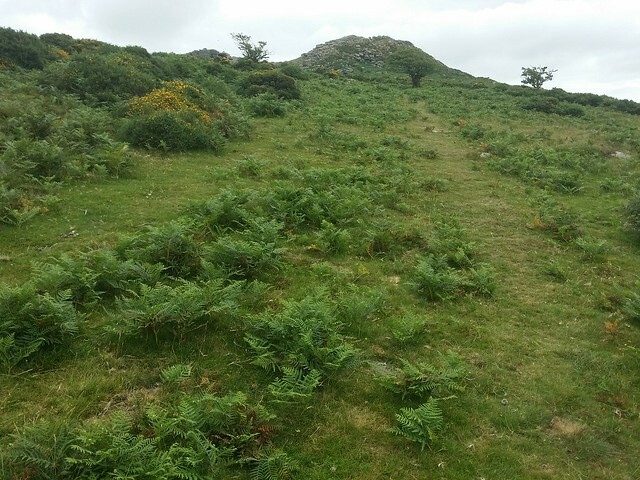 Whilst they made their crossings, I wandered on, in bare feet, up to Blacka Tor (East Dart). 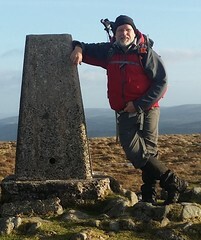 By the time I reached the outcrop on the side of the hill, my feet were dry and I donned my boots again. I sat here, waiting for Jim and Matthew to join me. This tor is a contentious one but rather than repeat myself, you can go to my Blackator Rocks Blog Post to read more. We sat awhile, then dropped down to the river again to visit the more well known and far more impressive Blackator Rocks. 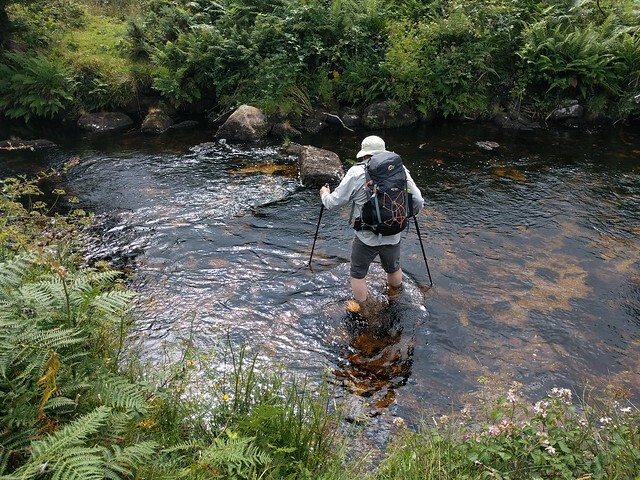 The quickest way back to Dartmeet required us to cross the river again. 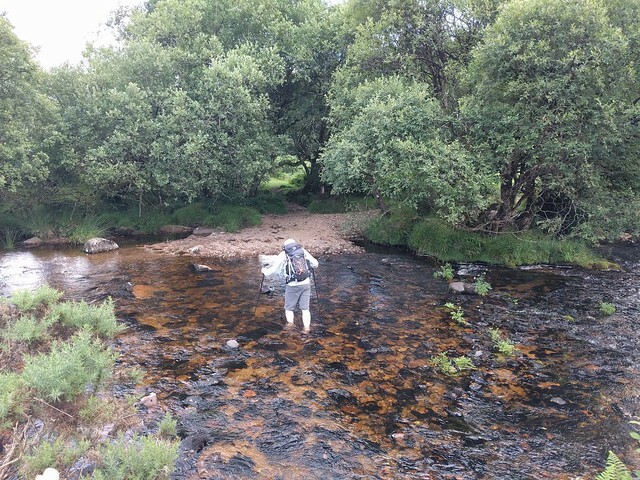 We found a ford further downstream, that looked sandy in places but turned out to be painful on the soles. 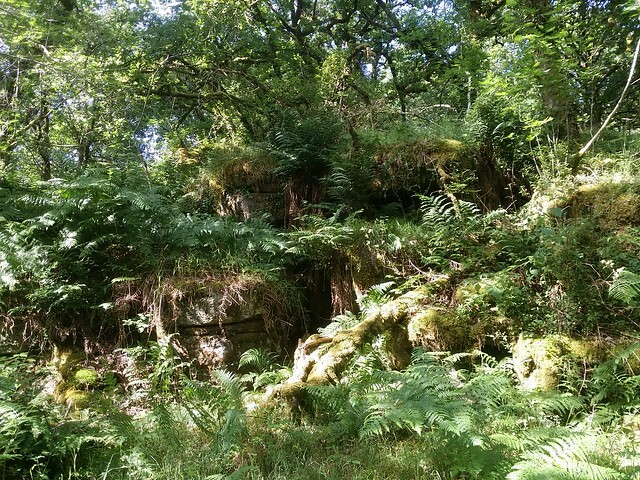 On a hot summers day, these overgrown environments are not the most pleasant places to be. Making our way east along the undulating north bank of the river, pushing through the bracken was uncomfortable and I'm scratching myself now at the thought. On a rare occasion we got to look up along the route, we noticed the hidden tors within the trees. 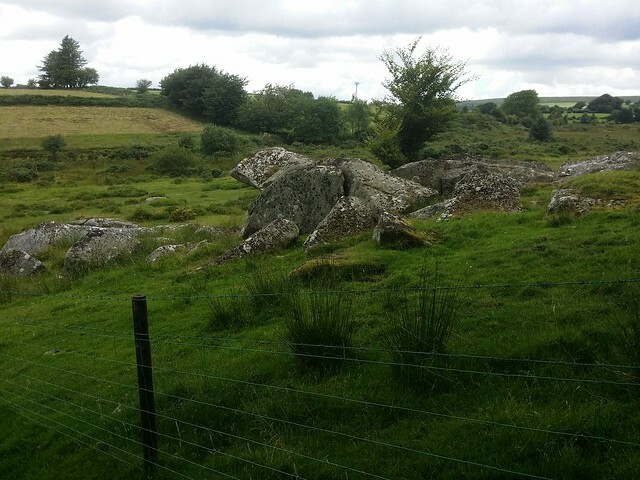 We couldn't think of a suitable name at the time but I've since found that it was named "Stone Park Tor", by Tim Jenkinson, being that it was within and enclosure of that name. We came out where the Wallabrook meets the East Dart, and went north up the bank to the ancient clapper bridge. From the bridge, we looked on with disdain at a family with a tent and a fire in the clearing beside the river. 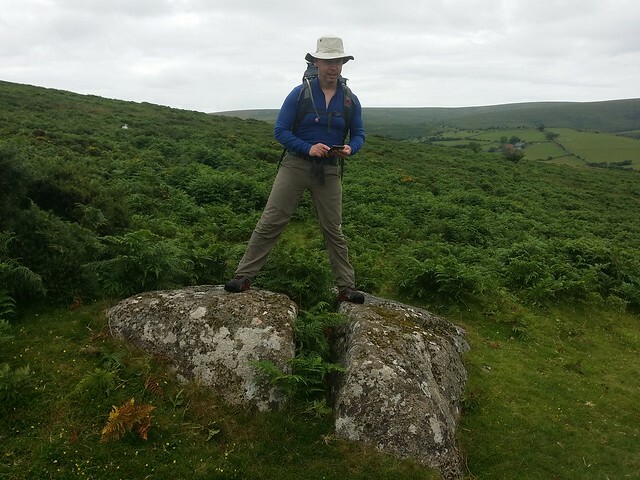 We intended to ring a Dartmoor Ranger as soon as we had a signal but it transpired that was a lot later in the day and the moment had passed. As we followed the river through Brimpts Northern Wood, we were passed by a procession of teenagers, armed with camping gear and slabs of beer. I can only guess at the carnage they would leave the next morning! 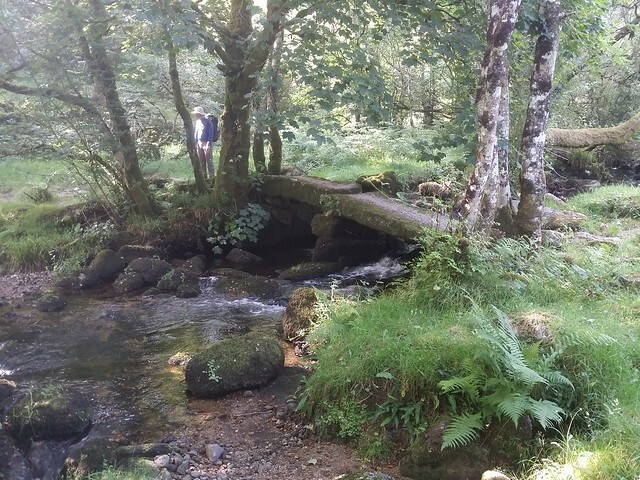 We arrived back at Dartmeet way past five, stopping off at Badger's Holt for a cooling drink before the drive to the pub. 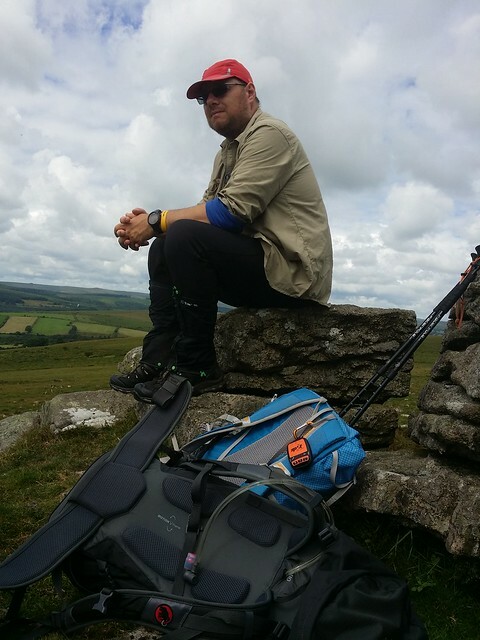 I was shattered and had, in my thoughts, the stiff ascent from Widecombe up to Hameldown, for our wild camp. We were going to arrive a lot later than expected, I hoped Colin and Neil were waiting patiently in the pub!